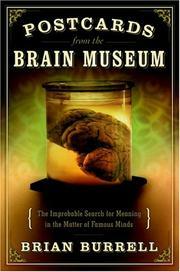 An examination of the scientific fad of collecting brains of the famous in hopes of discovering the key to their genius. Burrell (Mathematics/Univ. of Mass, Amherst; The Words We Live By, 1997) begins with the famous scene from the film Frankenstein where a scientist compares the brains of a genius and a criminal—a scene that appears nowhere in Mary Shelley’s novel but neatly suggests the prevailing attitude toward brains. The notion that the size and shape of a brain was key to its thinking power came originally from phrenology, and, tracing the careers of the early phrenologists, Burrell points out that despite the failure of their program of using skull shape to diagnose mental capacity, they nonetheless carried forward the radical notion that the mind is a direct consequence of physical structures of the brain. Later scientists removed, preserved, and examined the brains of both of those geniuses and violent criminals in an attempt to discover the structural differences underlying behavior. Many of those researchers—among them a number of American doctors and scientists—formed clubs with the object of donating their own brains for postmortem examination and the benefit of science. Sadly, little useful scientific work was done. Walt Whitman's brain was accidentally destroyed before it could be examined, and others got only perfunctory analysis. Worse yet, as in the case of the Italian criminologist Lombroso, some of the scientists’ work was later taken out of context and used to justify genocide and racism. Or, in the case of Lenin’s brain, the examining scientist cynically used the opportunity to gain funding for other work. In a useful concluding chapter, Burrell points out that, even today, the gains of brain science are at best controversial. A broad and revealing study of a little-known and often unflattering chapter of science.